If you’ve talked to anyone in the last week, chances are, you heard the story of 12 Thai boys and their soccer coach who were trapped in a cave for over two weeks after rising flood water cut off all escape routes. But in a rescue mission that began on Sunday, July 8 and took two days to complete, everyone was blessed with a happy ending. Now, we have more insight into how the group survived. 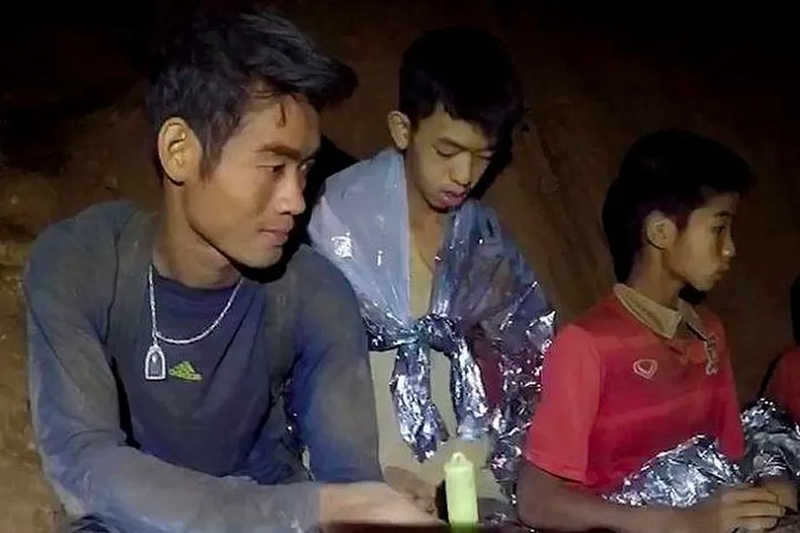 On June 23, 25-year-old Ekapol Chanthawong embarked on a hike into the caves with his soccer team. The kids were all between 11 and 16-years-old… a group so young you think they never would have lasted as long as they did. But if anyone learned that you should never mistake size for significance, it was the British divers who found them trapped in the cave on July 2. According to Vox, when the divers discovered the group of 13, they were meditating. As it turns out, their coach was an ex-Buddhist monk with a decade of meditation training. During the two weeks they were stuck down there, he taught his soccer players how to meditate. Doing this allowed them all to stay calm and level-headed despite being stuck in an extremely stressful situation. Ekapol Chanthawon taught his kids to do exactly that and it helped save their lives! Ben Reymenants, one of the divers who helped with the rescue mission, said that the coach did an hour of meditation with each kid before they were brought out of the cave. While this isn’t an everyday scenario, it’s a testament to the power of meditation and hope people see the value of this practice. If you’re like most people, you may feel that meditation will barely make a dent in alleviating your stress or anxiety – everyone feels this way. Or perhaps that sitting still for a long time will make you restless and bored. If either of these scenarios sounds like you, all we have to say is… try it! All you need is a few minutes of a clear mind to put things into perspective and everything else will fall into place. Meditation can be traced back thousands of years from hunter-gatherers staring into fires after long hunts, or rhythmic chants used by ancient cultures when praying to their gods . The structured practice of meditation, that is more or less the basis of modern meditation, is believed to go back 5000 years, beginning in India. The modern meditation techniques that we use now are very similar to the humble origins, and necessary to heal our minds more than ever in our frenetic pace of life. This is one of the most common reasons that people turn to meditation. Meditation for stress has been shown to be effective; one study that looked at over 3,500 adults found that meditation was able to lower their stress levels and help those dealing with anxiety, depression, insomnia, and pain. It suggests that clinicians speak to their patients and encourage looking into meditation as a form of treatment . Another study, using different meditation techniques, found that it was able to reduce stress in its 1,300 participants with transcendental meditation. Transcendental meditation is a technique used for avoiding negative thoughts and promoting a relaxed state of mind by repeating a mantra. The study found that this technique was the most effective on those who had the highest levels of stress and anxiety . Sara Lazar, a neuroscientist at Massachusets General Hospital and Harvard Medical school can concur. After starting a meditation practice after a sports injury, she learned first-hand the benefits of meditation and decided to look further into it. Her research revealed that people who meditate have an increased amount of gray matter in the insula and sensory regions, the auditory and sensory cortex. (This translates to better memory, clearer decision making, and less stress). A study published in the journal of Biological psychiatry by Carnegie Mellon University has found that mindful meditation techniques can also help to reduce inflammation in the body. Stress is often considered a major trigger when it comes to inflammation, so it’s no wonder that a reduction in stress also reduces inflammation . The study looked at 35 stressed adults who were looking for jobs. Half of the participants were part of a 3-day mindful meditation retreat, while the other half took part in a relaxation retreat with no mindfulness component. The participants completed brain scans before and after the programs, and also provided blood samples before the programs and after a four-month follow-up. The brain scans revealed that meditation increased functional connectivity between two brain areas that usually work against each other: the default mode network (involved in mind-wandering and internal reflection) and the executive attention network (key to attention, planning and decision-making). Relaxation training, however, did not have this effect. The blood samples showed that participants who had mindfulness training had lower levels of Interleukin-6, a biomarker of inflammation, than those who did the relaxation retreat. The researchers concluded that the changes in functional brain connectivity resulting from the mindfulness program seemed to help the brain manage stress (a known inflammation trigger), and therefore is responsible for the reduced levels of inflammation . A study conducted by the American Pain Society investigated the effects that mindful meditation had on reducing pain. The study showed that the participants’ perception of pain was significantly reduced after just three 20-minute sessions of mindful meditation that was spread out over three days. Other studies have shown that meditation produces analgesic benefits that alter your perception of pain—but it was believed these benefits could only be achieved with extensive meditation training. A short course on meditation could be enough to reduce a person’s perception of pain . The study also found that the analgesic effects of meditation and the participants perception of pain was reduced after the conclusion of the meditation sessions. This indicates that meditation may result in an overall reduction in perceptions of pain, not just during or around the time of a meditation session. This is compared to a control group that was tested using distractions, which did have some analgesic effects but only during the distraction . Just like fitness trains the body, meditation trains the mind. It can be difficult for some people to be motivated and to begin meditating, so we have created this simple step-by-step guide on how to get started on your meditation journey. Once you’ve nailed getting started, you’ll be able to meditate on your own for extended periods of time and reap all of its healing benefits. Prepare a space free from distractions that will serve as your center for meditation. Help set the tone of what you’re about to do with some relaxing essential oils or incense. Sit or lie in a comfortable position. You may even want to invest in a meditation cushion to help get you in the right mood. Breathe deeply, in through the nose and out through the mouth. Focus your attention on the breath and on how the body moves when you inhale and exhale. Pay attention to your chest, shoulders, rib cage, and belly. Simply focus your attention on your breath without controlling its pace or intensity. Use this method to start and maintain the practice for a few minutes, before moving on to longer periods of meditation. If you feel your mind begin to wander, try using mala beads to help bring you back into the present. Using meditation is a valuable tool for those who need some help centering themselves or dealing with pain of the body, mind, or spirit. Use these tools to help heal yourself, from the inside out. Shanker, D. (2017, February 15). Americans Just Broke the Psychologists’ Stress Record.